HGSI software has implemented in whole or in part the strategies, tools, formulas, methods employed by Charles D. Kirkpatrick. Some of these strategies are explained in the book below. Over the past 25 years, Charles D. Kirkpatrick’s exclusive stock-picking technique has outperformed the S&P 500’s performance by a whopping 7.7 times. That’s right: If you’d invested $10,000 in the S&P 500, you’d have $130,000 now…but if you’d followed Kirkpatrick’s published picks, you’d have $1,000,000! If that’s not amazing enough, Kirkpatrick’s system is remarkably easy to use. In this book, he teaches you all you need to put it to work in your portfolio. Kirkpatrick reveals why an active strategy based on relative stock rankings is the surest route to profit, and how just a few pieces of publicly available information enable you to create rankings that virtually guarantee exceptional performance. You will learn how to use his techniques to organize stocks into a portfolio that maximizes returns while reducing risk…uncover trigger points that tell you when to buy and sell…and systematically protect yourself against bad stocks and bad markets. Why the conventional wisdom about investing is flat-out wrong. What’s wrong with diversification, “random walks,” and the efficient markets hypothesis? Don’t even try to predict the markets: you don’t have to! Discover what the markets are actually doing: then react fast, with discipline. Invest the intelligent way: with “relatives.” Measure what really matters: a stock’s relative strength and growth compared with the rest. Start using the market’s reliable investment triggers. Recognize what to buy, what to sell, and when to make your moves. Mitigate the risks associated with broad market declines. Intelligently decide when to move assets into cash. HGSI has made it even easier to get started! We not only have the Kirkpatrick “Relatives” of Value, Growth and Price Strength ranking but the necessary Filters and Warehouse Views. Everything is there ready to go! This is what I refer to as the Ugly Duckling market in my reports and webinars - you have to buy the Ugly Ducklings deep down in their patterns since that's where the best price moves occur on a market turn, even a short-term one. 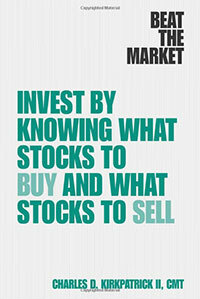 HGSI is the perfect tool for figuring out how to buy stocks in this manner. I attest to that! I have only recently starting using HGSI and with anything new can take a while to get fully up to speed. Thanks for all your videos you are producing. They are helping immensely.